The Great Dragon, guardian of the realm, lies in a slumber. An evil wizard has entombed its breath in the jewel Dragonheart. Now, fire dragons (of the bad kind) and trolls run amok, with only mere mortals to defend the land. They’re brave enough souls, but hopelessly outmatched. Can you, as the ancient Protector’s disciple, break the spell and free the Great Dragon? Or maybe you feel just a little evil yourself, and fight to keep him petrified forever! Dragonheart is a card game in which the goal is to collect cards from the display – or the game board – by playing other cards to the same. Even though it is a unique commercial deck with its own theme and artwork, it very much fits into the category of traditional fishing card games, albeit definitely a more intricate example. Players assume the part of either the evil wizard’s minion trying to keep the Great Dragon asleep, or of the beast’s disciple attempting to free him. However, this theme does not impact play in the slightest. Each role has an identical deck of fifty cards and pursues the same goal. That object is to collect the most points before the game ends. You begin with an empty board and 5 cards apiece. Individual turns proceed in three, quick and easy steps – play a card, collect cards, and draw cards. There are nine types of cards, some worth anywhere between 1and 4 points. Each type has its own convenient spot designated on the game board by identical illustration – so there’s no confusion as to what plays where. Some spaces also have multiple, layered outlines which specify the number of that type required to trigger an effect. And most spots have arrows pointing to it or away from it, indicating how it reacts with adjacent spaces. Playing a card to its matching space is pretty self-explanatory. Playing cards is straight-forward, affected by only a few rules. You can only play one type of card per turn, though you may play multiple copies of it, and these must be placed to their corresponding spot on the board. If that location has only one outline, you may play as many cards there as you wish. If it has multiple outlines, you can only play a number up to the limit indicated, including what may already be there. After playing a card, you may be able to collect others from one adjoining location. Those spots trigger this kind of effect, either individually or after finishing a collection. Arrows pointing from one space to another determine which plays claim which cards. A couple of spots point in two directions, providing an either/or option. Regardless of how many cards you play to a location, you only activate its collection ability once that turn. After collecting any cards, place them face down in a pile next to you and then draw enough cards from your deck to replenish your hand to five. The first player to collect a petrified dragon card by capturing it with a sorceress receives the cute, little dragon miniature. Whoever holds the dragon gets a hand limit of six cards, rather than five. When the current caretaker loses control of the mini, he/she randomly places one card from his/her hand back on the draw pile, while the new player immediately receives the 6-card limit bonus. 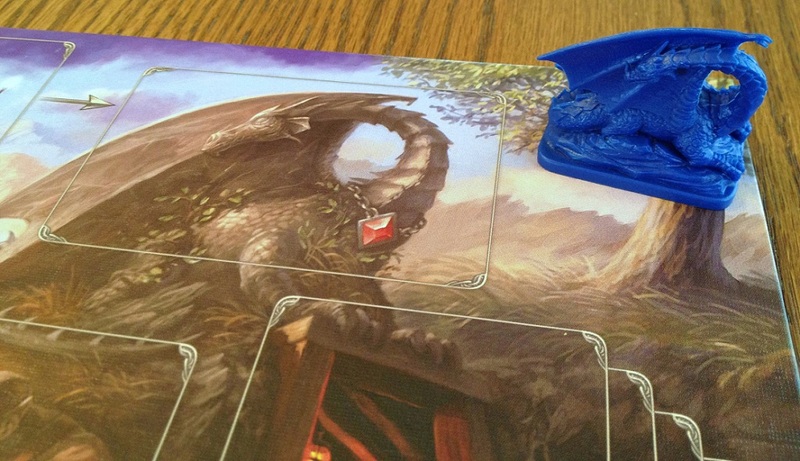 Owning the dragon miniature also provides a tie-breaker at the end of the game, in needed. Two things can trigger the endgame. The most common scenario involves ship cards. 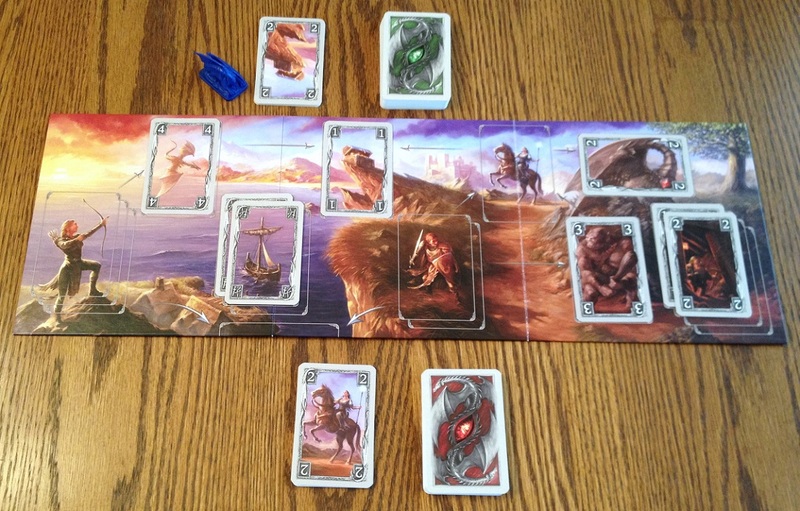 When a set of three ships is completed on the board, they are removed and stacked to the side – the player doing so also earns any huntresses and knights sitting below it. After a player finishes the third set of these, the next player gets one final turn. Less commonly, when one player runs out of cards in his/her draw pile, the other player likewise receives a final play. In both events, players then count the points in their collected cards only. The winner either frees the Great Dragon or keeps it petrified, depending on which role you chose – that is, if you can remember, because nothing about game play will remind you! The game in play…the board is quite intuitive. Master Yoda once said, “Do, or do not. There is no try.” Well, whoever wrote the rules for Dragonheart certainly tried to tie its theme in with game play. And failed. Don’t get me wrong – I appreciate effort, and the thematic flavor text is mostly on the explanations of card actions. Still, it’s humorous. It’s fun to read that a set of ships captures all of the huntresses and knights below it because, “Distant lands and new adventures call the knights and huntresses. Once their work in this land is done, they board their ships and, when the time is right, set sail for the next challenge.” Mkay. Dragonheart has a nice “traditional” card game feel to it, almost playing like an advanced version of Scopa or Casino. While the nine card types do not equate to a standard deck’s suits and numbers, they nonetheless serve a similar purpose in collecting cards. The design is very simple with only a few basic rules, and play moves briskly back and forth. The board is wonderfully intuitive, clearly outlining where cards are played and how the different spaces interact. But despite its simplicity, there are plenty of chances for deduction, baiting, and other strategic calculating. Dragons take the treasure, right? How stereotypical! Players have a tough choice between playing conservatively or a little riskier, and in deciding what cards to use in capturing others. If you spend a high-value card, or cards, to take something with lower points, you may just be setting your opponent up to snag what you just laid down. Unless you’re playing some bait because you want him/her to take up your cards, knowing that you have a hand to collect the ones that he/she will need to play! Some spaces have a set collection element, requiring multiple cards to trigger its effect. If you don’t have enough of that type, but find yourself with few other safe moves, you might be able to play one card there, using the location as a delaying tactic. Then again, you could also just be playing into your adversary’s hand as he/she swoops in behind you to complete the set and snag its rewards. Two spots, the treasure chest and petrified dragon locations never trigger a collection. Instead, you can use these to hoard points to collect for yourself later on, lure your opponent into playing another card that collects either of those two, or simply sluff off some unwanted cards. In any case, playing a card, or cards, isn’t as simple as just laying down whatever fits in order to get some points. Well, it could be. However, the winner will carefully calculate how his/her moves will not only gain cards now, but how such moves may possibly set-up chain reactions between you and your opponent. Looking a turn or two ahead needs to be part of your strategy. For example, the Knight requires two cards to activate its collection event. 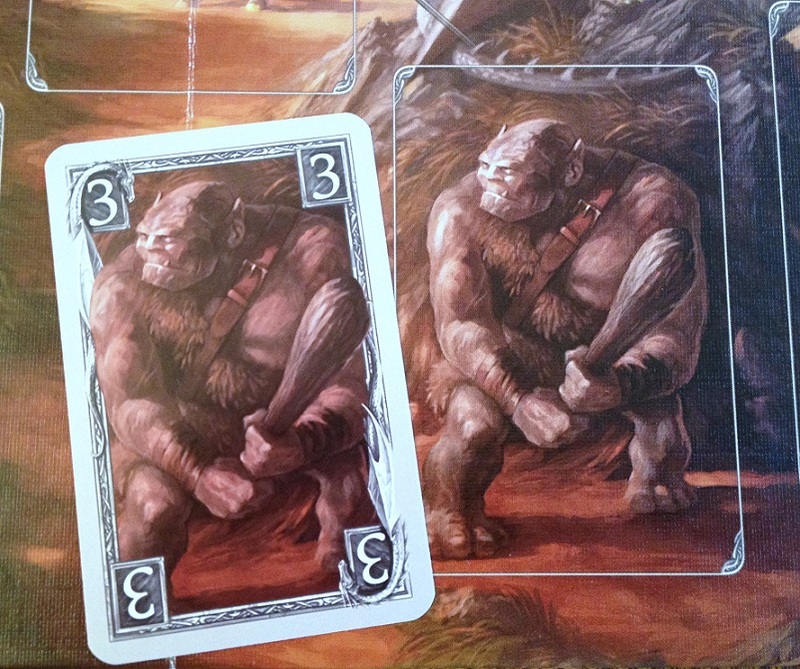 When doing so, you get to take any card/cards in either the sorceresses spot or from that of the troll. Playing just one is generally more risky in setting up your foe. 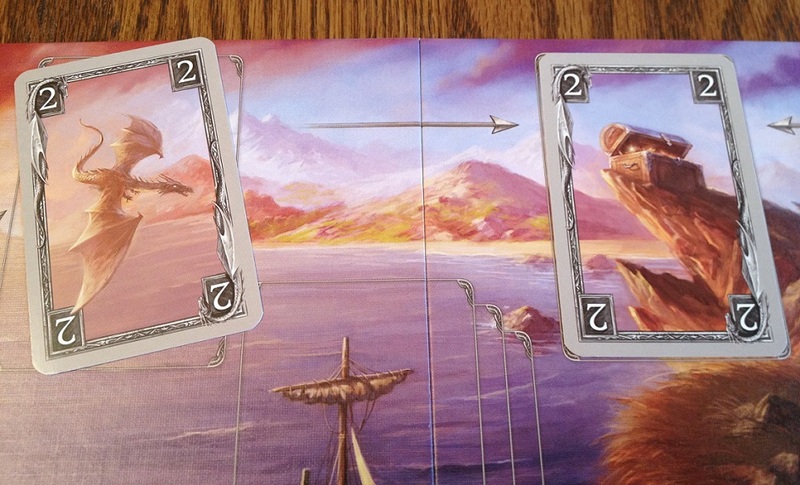 However, if you have ships to play, you can lay down that single knight, hoping the other player will finish the set and send the pair below the board, so that you can claim them with a set of ships on the next turn. On the other hand, if you play both knights to claim cards from the sorceress or troll spots, then you’ll earn points, but might then entice your opponent to play his/her own ships. This will bring the game a little closer to an end, so you may want to make sure that doesn’t put you in a bind. It may be worth it, however – knights are only worth 1 point, while sorceresses can be up to 2, trolls as high as 3, making for an exchange decidedly in your favor. Other spots on the board have similar dual interactions and consequences. And if one doesn’t, it’ll still provide its own dilemma. The petrified dragon does nothing except lead to some one gaining the miniature by taking it with a sorceress. Do you risk laying one down, with a sorceress in your hand for the next turn? Or is it worth giving your opponent the chance? The dwarfs present an interesting stand-off. This spot does not interact with any other. Instead, whoever lays down the fourth dwarf claims them all – and their points (between 1-3). It’s its only little “mini-game” of bluff and impasse. Card play always has some interesting and shifting dynamics thanks to the hard-coded relationships on the board. The sorceress can collect the treasure chests or the petrified dragons. The replay value is equal to most any other card game. Once you’re familiar with Dragonheart, you know what you’re getting each session. You have the same deck of the same number of cards with the same chances of play. There is no designed mechanic to generate variability from game to game. This, of course, is no different than any other classic card game since the invention of paper. But its replayability is predicated upon tactically managing your hand, while matching wits with your opponent. Given that single games average around 15 minutes, the level of depth and scope are well-suited to the design’s purpose and target audience, which again helps create a classical impression. Now, there is indeed randomness. Despite the general options, tough decisions, and opportunity for clever strategy, the whims of chance can always hamstring you from time to time. It’s the nature of card games. Managing that luck is part of the genre’s appeal. However, those averse to these sorts of limited card games probably won’t find much in Dragonheart to change their minds about the subject. The fantasy theme is fine and the artwork is really nice – by veteran board game illustrator Michael Menzel (of Stone Age fame). Adding “theme” to simple card games is a proven way of setting them apart from their plainer, classical cousins. Even though gamers realize it has little impact on actual game play, it can make these designs a little more attractive. With Dragonheart, however, it might ironically serve the opposite. Those wanting and expecting a fantasy-oriented card game will be sorely disappointed, while other casual gamers put-off by the genre may not be willing to even try it, though it’s pure window dressing. The 4 dwarves complete the set. Dragonheart has a few interesting contradictions. It is a fast-paced game that can sometimes still go overly long. It has wonderfully thematic artwork with absolutely no impact on game play, probably turning off some gamers nonetheless. It offers plenty of strategy that swings on a bit of luck. Most of all, it is very simple to learn, but actual game play is much deeper. You must read your opponent, be willing to sacrifice points, and patiently bide your time until just the right moment to strike. As such, Dragonheart is a nicely accessible game for two – which can be played lightly social or tactically Chess-like – in the best tradition of classic card games.